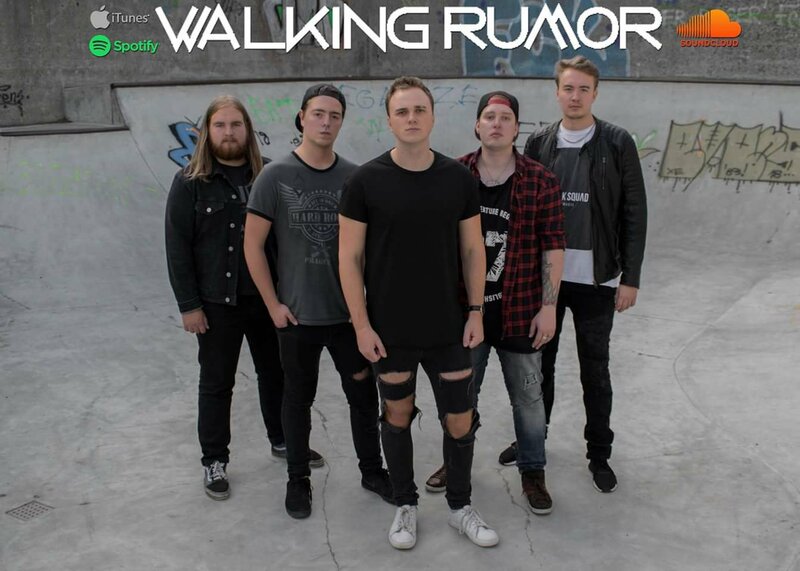 Walking Rumor is preparing to release their new full length album Symbiosis this year. How much of the album has been completed? We can gladly announce that the album is complete, and we are looking for a potential distribution deal. It was produced by Claudio Andersen from LAK Studios and mixed/mastered by Chris Kreutzfeldt. How did you and the band hear about LAK Studios? We are a band that always wants the best team possible to work with, so we aren't afraid to go to great lengths for that to happen. During our pre-production we reached out to a fellow Danish band called Siamese, because we were curious about who recorded their music and where. We got a response from Mirza, their vocalist who got us in touch with Claudio Andersen at LAK Studios where Siamese recording some material at the time. Had you worked with Andersen and Kreutzfeldt previously or was this your first time? Before the recording of the full length album began, we worked on our teaser single Wasted Years with them. They did an amazing job and we had such an amazing connection, so we were excited to continue working with them. Having those two on a project like the Symbiosis album was like having two mind readers. They understood how we wanted our sound from the beginning and had much interesting input. How many singles in all did you release before you began working on Symbiosis? We've released four singles in the past, 'Proud of Me' being the first. 'Proud of Me' was actually the first song that we wrote as a band. It kinda cleared the path for us in the beginning. We released 'Dedicate To This' and 'Tears Me Apart' in cooperation with our previous label Mighty Music. 'Wasted Years', our latest, is a teaser for our upcoming album. Have all four of your singles been well received so far? It's funny you should ask that because they've all been received beyond our expectations, which we of course are thankful for. When we released 'Proud of Me' it was more of a way of saying: "Hi, we are Walking Rumor and this is what to expect from us". We had no idea that people would receive it so well and it would spread fast. It all happened faster than we could have ever hoped for. We hadn't the slightest idea that the first song we would ever release would be on the biggest rock radio show in the country just four months after. We even ended up representing Denmark in the Global Battle of the Bands 2016 in Berlin. This was our fifth show in all, so things were happening insanely fast. The two other singles, 'Dedicate to This' and 'Tears Me Apart' were received as a follow up to the success of 'Proud of Me' and our EP 'The War Within'. The support we have gotten from people has been truly amazing and we are forever overwhelmed. When 'Wasted Years' came out it was like dropping a huge news bomb on the fan community, because there hadn't been any talk about a potential album from us prior, so seeing how engaged the fan base is in the arrival of a full length album is truly exciting for us to see. Was 2016 the first time you performed at Berlin’s Global Battle of the Bands? Did other bands you are acquainted with appear at this event? 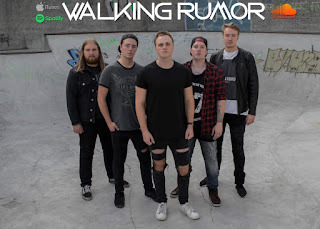 How did this show turn out for Walking Rumor? We were all bands from different nations from all over the world, so we didn't know anyone before we got there. We still keep in touch with some of the bands that we met there. We actually won third place for people’s choice, so we didn't return home empty handed. I personally am proud of that fact, based on how little experience we had as a live band at that time. What bands from what countries are you staying in touch with since the event? Have there been any discussions about hooking up a show with any of them in the near future? We've stayed in touch with Vonavibe from Greece, Vorbid from Norway and I'm not sure if Bow from Poland is still doing their thing together. That was a dream that quickly came to mind with all of us at the event, but an arrangement like that takes a lot of planning. We haven't forgotten about it and we would still love for that to happen one day. What are the songs you recorded for The War Within? In what ways was recording it a step up from releasing singles? We recorded 'The War Within' EP at Mørkværk Studios. Christian Agaton is an amazing producer and really helped us a lot setting up the beginning of our career. We recorded the EP back in 2015 and released it in 2016, which ended up a busy year for us. Things just took off after that. Releasing a single may be in some viewers’ eyes the way of earning money in the music industry these days. But if you want a potential booker to take you seriously as a band, he/she needs to see that you got more than just a few minutes of material ready for a show. How much of a help was Christian Agaton when he produced “The War Within”? Would you work with him again if you had the opportunity? He had a huge impact on the entire EP actually. He is a man filled with ideas, visions and creativity. It's like he saw the entire project from a perspective we hadn't even thought of. Christian is a very honest producer. He can take any track with a skeleton and make it sound really good. I clearly remember when he was producing our single 'Dedicate to This' and everything was finished, we just had to put my lyrics on the track. I went into the booth and recorded my parts until he just stopped tracking mid recording and looked at me intensely through the glass. He told me to come out of the booth and sit down beside him. When I sat down he looked at me and was like; "You know I mean the best when I say, that this is crap". He didn't feel I actually expressed what I wanted to with the lyrics that I prepared, like I didn't mean it. So he asked me to spend the night writing something entirely different and have it ready by the next day. I had to write about something that actually really bothered me. I spent that entire night writing the lyrics on 'Dedicate To This', because I wanted to achieve success. I highly recommend any musician out there who wants a new spin on their stuff, to contact him today and set up a meeting. How much of a transition was it from releasing singles and EPs to starting work on a full length? We had in no way prepared for this step, but before the decision came I was talking to a friend regarding the future for Walking Rumor. He made an excellent point by saying: "You've already made an EP, released two singles and now we should be seeing a full length album from you guys". I couldn't agree more because it wouldn't make much sense for neither us nor the fan base to just see another single or EP. The band needs to move forward and the time is now. Describe how you composed and arranged the songs appearing on Symbiosis. What musical and lyrical statement is the album intended to make? The songs are mainly the outcome of parts of previous songs we've worked on in the past. It has been a long process that hasn't been without challenges and complications. Writing a full length album for the first time isn't an easy task to handle, especially because we wanted it to be as good as it could be. We mainly write our stuff as a group. A typical process could be that Andreas (guitar) comes up with ideas for riffs, puts them together with other riffs that Anders (vocals) may have come up with on guitar, I (Kenio) usually see each riff or written part as a building block and I love putting it all together. The skeleton gets presented to the rest of the group for judgment and the band puts the final touches on it in terms of bass and drums. The main intention of this album is to make material that is as honest as it can be. We want to share what we feel, think and experience in a way that is relatable. Were there specific ideas you presented to Andersen and Kreutzfeldt during the recording of Symbiosis? Communication was important during the whole process, since we began working on pre-production. As we finished our ideas at home, we would pass them along to Andersen and he would give us feedback, like what would be more modern, interesting and get us closer to the message that we'd like to send. We did this with every song, so I can't say there was one specific idea that meant more than others. By the time the recordings began, we had actually lived in the studio for two weeks. We brought our sleeping gear, food and clothing and just camped in the studio lounge. The reason was because the studio is far from home and we worked 18-plus hours a day for two weeks straight. We owe Claudio Andersen and the rest of the LAK Studios employers a great thanks for that. How receptive were Andersen and Kreutzfeldt to your suggestions when you presented them? They understand the fact that it is the artist who writes the album and thus in charge of what happens to it, so they weren't trying to force any ideas onto it. With that said they provided us with some great ideas and we couldn't be happier about the result. LAK Studios consist of a professional team that we are proud to have worked with, and definitely will again. Describe your experiences living in the studio for two full weeks. In what ways did this have an effect on the completed album? Being with the band is kinda like your family away from home, so it was a lot of fun. We understand each other and know each other’s limits very well. Back in 2017 we toured Europe with Ill Niño for a whole week and we had a blast, so it wasn't a totally new experience. Of course it had an impact on how the album turned out, because you don't really get that privacy from one another and you easily tend to be up in each other’s recordings, luckily for us in a creative way. It gave us an opportunity to contribute ideas during the recording sessions, which gave us a very open minded working process. This however took time from our booked schedule with Andersen at LAK Studios, but it was totally worth it. Personally I think the album got lifted those extra 30% because of it. What recording and mixing equipment was used to work on the songs? I can't really give away the secrets about how we achieve the "sound". But we use a wide range of digital equipment during the recording process. LAK Studios provides the rest. Who wrote the lyrics for the album, and which songs present their ideas to the listener most effectively? Primarily I (Kenio) write our lyrics, but I would never pass on the lyrics to the final process without consulting the rest of the guys. When I write lyrics I of course write about what's on my mind, but I want to express it in a relatable way. So I bring my lyrics to the guys and ask them to take a hard look at everything, to make sure everything actually sounds like something that we all can stand behind. This process may not always be very pleasant, because it's a process where you've been sitting in the very deepest parts of yourself and wrote the most honest thing you could possibly struggle with. You are basically pouring out your soul on a piece of paper and then handing it to a bunch of people, whose job is to tear it to shreds basically. It takes a lot of soul searching and self-honesty to do that and trust in your team. Answering what song represents the idea the most is hard to say, because everything is so divergent and every song differs. If I had to choose some that stands particular close to me, it would be songs like 'Expectations', 'Let Them Talk' and 'Burned Up and Blessed'. What is the subject matter of 'Expectations', 'Let Them Talk' and 'Burned Up and Blessed', and what inspired you to write them? When we write lyrics, we don't like to spell everything out for you. We like to write our stuff so that you can relate to it in your own way. With that being said, I can only describe my own line of thoughts while writing the lyrics. “Expectations” is mainly about that constant battle you have inside your head when dealing with depression, anxiety or some other demon that keeps putting you down, telling you that you aren't good enough and that you shouldn't take a leap of faith. This invisible problem that no one else around you pays attention to, yet they want you to perform your best possible, without sympathy for the constant struggle you deal with every day. Who do you trust in this situation? “Let Them Talk” is a song about not losing hope even when everything seems bleak. It encourages you to trust your instinct and believing in yourself. You can do whatever you want, if you just put your mind to it. Don't let anyone or anything hold you back. “Burned Up and Blessed” is difficult to describe. It all came from a darker time in my life where I was really struggling with some horrific demons of my own. I put my faith in people very dear to me and I eventually ended up being burned by some, blessed by others. The whole thing took me down a path that was very unclear and I wasn't sure where I could go or who to talk to. I guess you could say that it came from a big variety of events during that time. It's not like I write about one particular heartbreak or one particular day where I had a little too much pepperoni on my pizza. We want our stuff to be as honest as it can be, so when you listen to it, you can relate to it in your own way, because we all feel the same in one way or another. Being a nu-metal band, what is the band doing to keep the genre fresh and inventive? What do you mean by generating material with a sense of honesty? It's all about letting your guards down and not let yourself get stuck in a box. You have to be open to what's going on in the music industry right now and embrace the fact that you need to step up your game. Putting guitar on a beat is just not going to cut it anymore, people want something that is fresh, new and inspiring. I won't say that we are any of those things but we certainly do try to be. That is actually the reason why our first full length album is called 'Symbiosis'. We experiment with a lot of different genres like heavy metal, pop, alternative rock, hip hop and electronica to name a few. This we feel goes into perfect symbiosis with each other to create the sound that is Walking Rumor. Writing and performing with material that you feel to your very core convinces the audience of your authenticity. Of course we could write a song about drinking every night at the club, dancing with women and driving fancy cars, but what kind of message would that send? It all would be a big lie with no emotions to spread for the audience. When I say we want to be honest, I mean we want to express what is truly going on for us and probably for someone else out there. That one kid out there who is struggling, needs to know that he/she isn't alone and that we can relate. How soon do you expect to release the new album? Are you seeking labels from more than one country for distribution? There hasn't been a set release date for the album yet. We are currently in the process of finding a distribution deal that will do the album justice. We have been in touch almost everywhere from Denmark to Sweden, Germany, UK, America etc. We have created an album that we one day can look back on and say; this is something I am really proud of. I believe that we've achieved that. So of course we want a deal with someone who believes as much in this album as we do. Will Symbiosis be available on digital format and social media as well as CD format? Is the band also considering cassettes and vinyl? Which format do you think will work best? Symbiosis will be available on all streaming platforms and as a physical CD. We have plans for a vinyl edition in the future. We've seen other bands selling vinyl and it seems like retro is becoming modern again. It's hard to say what works best, but my best guess would be streaming platforms, because it's so easy to just grab your phone and listen to us anywhere, instead of having to pop the CD in the stereo constantly. I remember doing that with my favorite bands back in the day. Such a different era. How many streaming platforms will you be uploading Symbiosis to give it the most exposure? With the right distribution deal, as many as possible. At the top of my head we would be interested in platforms like Spotify, Amazon, iTunes, Wimp, YouSee Music etc. How much is your fan base anticipating you releasing a full length, from the buzz you’ve been generating about it? The support about it has been amazing and we get asked almost daily when it is to be released. We wish we could say more at this point, but we are still in the market for a good distribution deal. There have been messages from fans in Denmark, Sweden, Germany, America, the UK and so on. We had no idea that so many wanted this for us and we can't wait to release it for everyone to hear. How often will the band perform to support the release of Symbiosis? How much promotion will you be doing for its release? We will perform at often as possible. The shows are what's important and we love to meet our fans. We have recently signed over to a promotion company named Kingart Music in Sweden that will handle our promotion. So hopefully as much as possible. Would you like the band to become well known in the US? How well do you think nu metal listeners in America will respond to you? The band has strived for the US since the beginning. That has always been our main goal. Hopefully they'll respond with a positive response. Cool, insightful and in-depth interview - nice read, thanks! Poem: 'Rip Me Apart' by S.C.C.